Galleon Blog | Capital Growth - Where to invest in Spain? 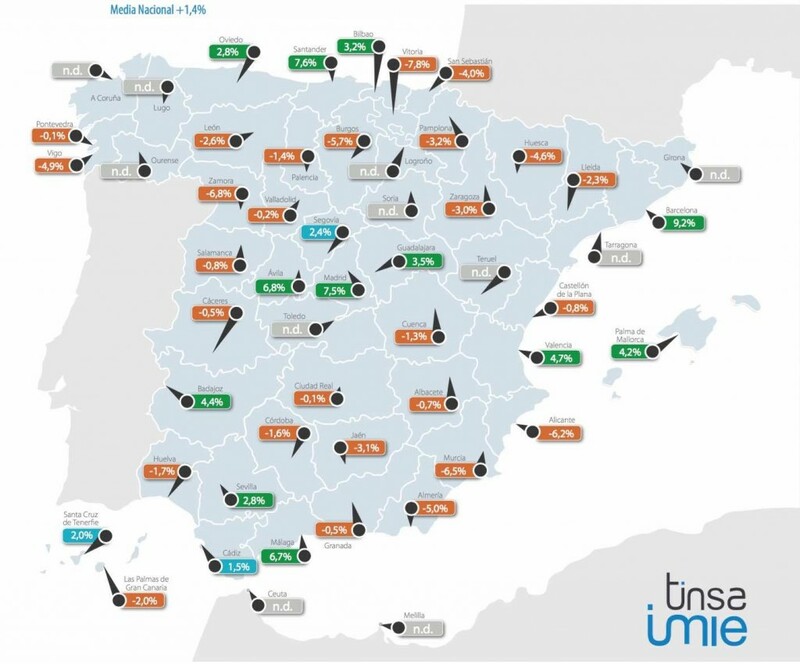 The picture of a two-speed housing market is clear from the latest data published by Tinsa, Spain’s leading appraisal company. Average Spanish house prices rose by 1.4% in the first quarter (Q1 average price compared to Q1 2015), but the average disguises big regional variations. House prices rose the most in Catalonia, around Madrid, the Balearics, the Canaries, and Malaga province, home to the Costa del Sol, as illustrated by the map above. The provinces coloured in green all rose above the national average, whilst provinces coloured in orange saw house prices fall. Most of the provinces where prices rose where in coastal areas or around Madrid, all areas that benefit from foreign demand on top of local demand for first and second homes. Notable increases took place in Santa Cruz de Tenerife (Canaries) and Catalonia’s Girona province, home to the Costa Brava, both up 5.9%. The only provinces with a coastline where prices fell were Alicante (Costa Blanca), Murcia, Cádiz (Costa de la Luz), Pontevedra in Galicia, and the Basque Country’s Guipuzcoa province. The big surprise was Alicante, the Spanish province that attracts the greatest number of foreign buyers, in particular the British. We will have to wait for more data to see if factors like the Brexit question and a weaker pound reduced British demand enough at the start of the year to influence Alicante’s house price figures in Q1. Most of the provinces in the Spanish interior are still in the doldrums as far as house prices are concerned. Prices fell as much as 7.8% in Alava, 6.7% in Teruel, and 6.3% in Jaen. On the whole, Interior provinces attract little foreign demand, leaving the market entirely reliant on local demand. Barcelona property prices were up 9.2% in Q1, and 7.5% in Madrid, the two hottest markets according to Tinsa’s data, with Barcelona now almost into double-digit annual price increases. Prices rose in all districts of Barcelona and Madrid. Prices were also up in Malaga, capital of the Costa del Sol (+6.7%) and Santander, capital of Cantabria, on the north coast. However, prices fell in the majority of Spanish cities for which data was available, suggesting that it’s still too early to talk of a nationwide recovery in the Spanish housing market. It’s very much a two (or more) speed market for now, with Barcelona and Madrid way out front.